That is how the animals came unto the Ark. This is an important message, not just for Noah and his family, I believe this is the resounding theme of the DockDogs Community. Each of us has a person who reached out to us when we started in this sport. A person you will never forget. Even if it was something as simple as handing you a poop bag when you stood in line and your dog chose the wrong time to relieve him/herself. Or the person who got into the pool and helped your dog jump for the first time. Or maybe the person who dried your tears when your dog crossed the rainbow bridge. Or the person who lit the fire of excitement about dogs jumping into the water. On August 19, 2015, a baby boy named Noah came into the world too early. 26 weeks of gestation. All the odds were against him. He weighed a mere 30 ounces. 30 ounces. Too small to breathe on his own and too small to digest food. He relied on breathing machines and IV feedings to keep him alive. He endured multiple surgeries. Heart surgery. Many stomach and intestine surgeries…so many in fact that he developed Short Gut Syndrome, meaning, his digestive system was too short to process food. Surgeries for long term IV access. A gastric tube to give medications that could only be absorbed by his very small stomach and eventually, to nourish him. 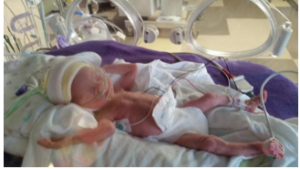 His premature heart took months to grow large enough to support his tiny body. But this was only the beginning. I have been a medical practitioner for over 30 years and I know from firsthand experience that our fancy, modern, and digital equipment can only do so much to keep an infant “alive”. The most important factors in becoming a human are the connections we begin very early in life and set the stage for our ability to bond, to love, and to thrive. Enter Jay and Deb Harris. 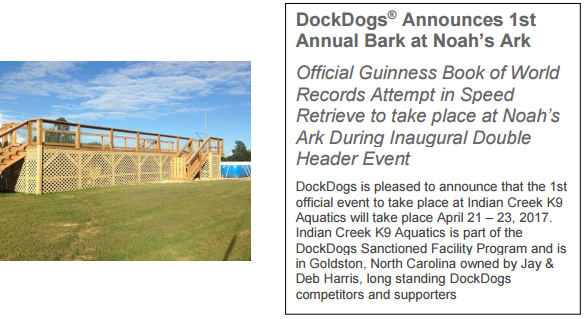 Jay is the founder of Carolina DockDogs and the club affectionately refers to Deb as the “First Lady of Carolina DockDogs”. Jay and Sir Harley, his beloved yellow lab, were inducted into the DockDogs Hall of Fame in 2012. Jay was “that person” for me. I wasn’t even jumping a dog at the time. He was just so dang excited about the dogs jumping into the water! I caught the bug and I have stopped trying to cure it. 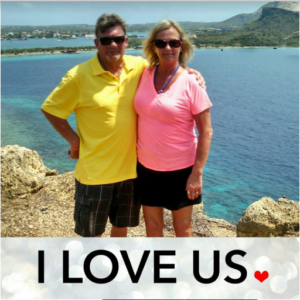 Noah is the grandson of Jay and Deb Harris…. and he needed them. He needed a stable home and a family to love him and support him. 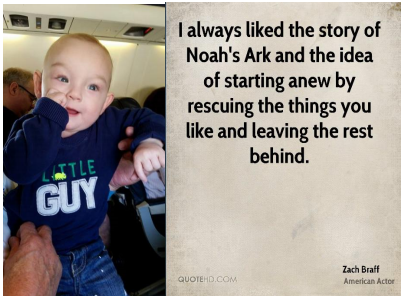 Noah was not able to come home from the hospital for many months. His care, even at that point, was very complex. Medications. Feedings. Physical Therapy. Speech Therapy. Jay and Deb took the time to learn everything about Noah’s care. They adapted their home. 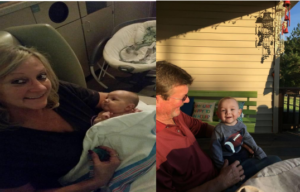 Then, at the dawn of their Golden Years, they brought home a 7-month-old baby on March 28, 2016 Not just any baby. Noah. Things are going well for the Harris Family. Noah is thriving. He is happy. He is loved. He has become a part of a Community, an extended family of Mothers, Fathers, Uncles, Aunts, Grandparents, Sisters, Brothers, In-laws and Out-laws, Neighbors, oh and Dogs. Jay and Deb built an Ark. No really, an Ark. A trust fund for Noah has been established by Grant Reeves, CEO of DockDogs, and the Harris’ to protect his future health and educational needs. A Board of five members will administer the funds for Noah’s care and needs. “The Harris’ are no Spring Chickens!” The Carolina DockDogs Club will be hosting a Silent Auction to raise money for this Trust Fund. We need your help. We are asking the Dockdogs Club Affiliates, Sanctioned Facilities, Teams, and individuals to donate gifts to be auctioned at the First Official event to be held at The Ark. If you attended the B.A.A.R.K. auction at World Championships 2015, this will be a similar event. However, we will be doing an Auction App to allow those not in attendance to bid on items, it will all be live bidding on the App! (More details to follow about joining in) Because this event will be held “virtually”, items for auction can be electronic as well, for example, a gift card to Amazon…PETCO or PetSmart…or DockDogs credits! Or Club Credits! Or a Club Membership! Or a DockDogs Worldwide Membership! Or use your imagination and GET EXCITED PEOPLE!!!! WE AREN’T IN CHURCH!!!! WE AREN’T AT A GOLF MATCH!!!! Pardon my digression. Just wait until you meet this little guy. He will melt your heart and your purse strings. I hope that you and your club or facility will consider a donation to this live auction. It would mean the world to Noah and his family.